10 Pin Shuffle is Digital Smoke’s take on the popular sports bar game Shuffle Board. Actually, there’s two games for one—classic shuffle board and a bowling version of the game complete with bowling pins. Striking Looks: Whether you’re playing 10 Pin Shuffle’s classic shuffle board mode or (in this case) the bowling version of the game, the graphics are quite impressive. In the classic version of the game, you slide a puck down a wooden table and get it as close to the other end as possible without going off the edge. The closer to the edge, the more points you get. Adding to the game’s strategic quality are defensive blocking moves and the ability to slam into an opponent’s puck, sending it flying of the table and preventing the other person from scoring. Only one player can score per round. The first person to score either seven, 11, or 21 wins. The bowling version of the game is essentially played like a regular bowling game, except it’s done on a shuffle board using a puck instead of a bowling ball. In either game you can play against the computer, just practice by yourself, or play a friend in Wi-Fi multi-player mode. You can also play a two-player game on the same device. The controls in 10 Pin Shuffle are super smooth and accurate. You aim your shot and then with a flicking motion, send the puck sliding down the table. While the game is simple, it takes a little practice to master. The physics in 10 Pin Shuffle seem to be really accurate even with ten bowling pins flying around knocking each other over. 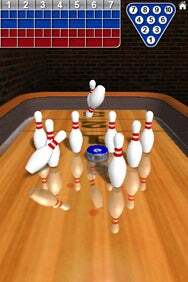 10 Pin Shuffle’s graphics are really nice with great shading and the reflections of the pins on the wooden table. Audio is another area where this game shines. The sounds of the cheering and jeering crowds as well as the realistic crash of the pins as they slam into each other help immerse you in the game. You can even listen to your own music while playing.